The Association TERAdaMAR, the Province of Rovigo and the Council of Occhiobello inform you that, for reason beyond their control, are forced to postpone the Event in the 2011 Spring. W I L L K E E P Y O U I N F O R M E D ! More and more people are choosing cycle tourism for their holidays, for travelling or for nature watching. “Slow” cycle tours in Europe are gradually becoming a mass phenomenon involving people of all ages. After the Cycle route was constructed on the left bank of the river Po, it is turning into the most important cycle track in the entire Province of Rovigo gaining importance even at European level. The Orienteering cycle event is intended to enhance the Left Bank of the river Po in the area surrounding the Province of Rovigo from a tourist and cultural point of view. The competition starts off along a predefined route with marked points that the participants have to find. These areas must be identified with the use of a map provided by the organiser. Discovering the region, which comes hand in hand with orienteering events, makes this sport an ideal means of getting to know and seeing the place in a different light. 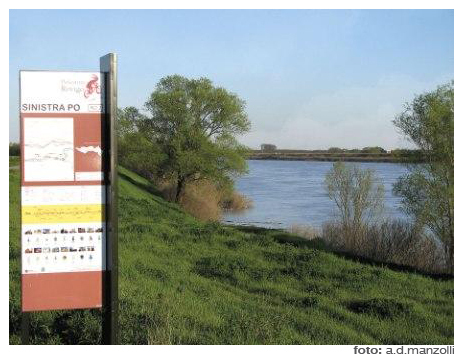 Over the course of three days, the event on the Left bank of the river Po will take place over the stretch that runs from Melara to Pila in the Council of Porto Tolle; a length of approximately 140 km. The intention is to introduce and promote an area that covers twenty Councils: Melara, Bergantino, Castelnovo Bariano, Castelmassa, Calto, Salara, Ficarolo, Gaiba, Stienta, Occhiobello, Canaro, Polesella, Guarda Veneta, Crespino, Villanova Marchesana, Papozze, Adria, Loreo, Porto Viro and Porto Tolle.